When your network is down, your business is down. 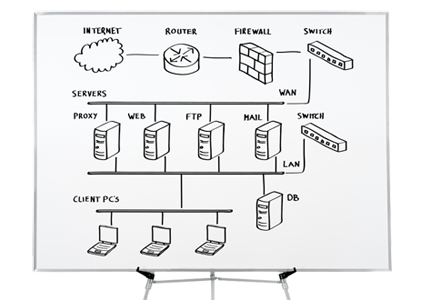 Let us manage your network so you can get back to business. No matter what industry you’re in, or how small or large your company is, your success depends on consistent availability and access. Let us handle your network support services, while you focus on what you do best, running your business and helping your own customers and clients. Our company has worked with Charm City Networks for over three years and they have been awesome. As an emerging company experiencing rapid growth, our communication and IT requirements have evolved and changed. The team at Charm City Networks have been able to anticipate our needs and ensure we have the equipment and services to meet our growth challenge. We feel very fortunate to have them as our IT/communication partner. President & CEO Noxilizer, Inc.
My organization has been a client of Charm City Networks for several years now. We have found them to be very knowledgeable and accessible with proven ability. Whenever we have a technical problem that we can’t handle we are always confident that Charm City Networks can fix it. They have never let us down. President at American Limousines Inc.
We first found Charm City Networks back in 2010 in a web search for local Baltimore based IT solutions. It was the best call we ever made! The professionalism they exude along with their response time has allowed me to focus on my business and not on IT issues. As a business owner, I want my information at my fingertips and access to it immediately. Charm City Networks has worked hard to keep everything running, networked, backed up and current. Without exception, the work they have done for Absolute Companion Care has been exemplary. Our company, Mid-Atlantic Acoustics, Inc. has been working with Charm City Networks for over ten years and we have never had to look for another IT company to handle our needs. They have grown with all the changes that take place in the industry and we have been recommending them to others along the way without concern for the work they will perform. Proud to be one of their longest patrons.